4 Bedroom Detached House For Sale in Plymouth for Offers Over £315,000. A four bedroom detached family home located on a corner plot which has so much to offer. 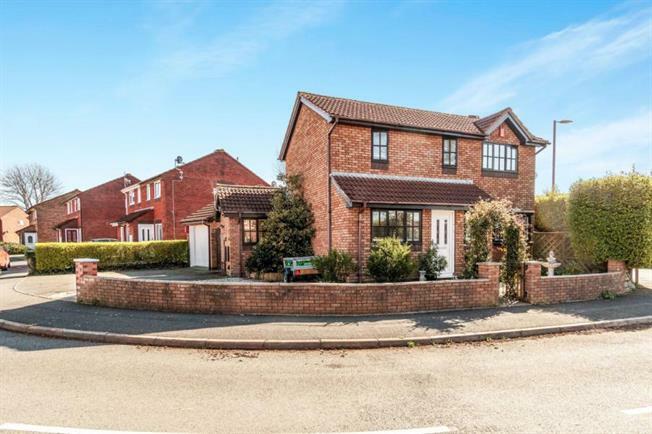 With extensive parking for four/five cars, a garage and a southerly facing enclosed rear garden. This property has been maintained to a good standard comprising; lounge, Kitchen/diner leading onto the garden, W/C and the third bedroom. On the first floor there are three bedrooms. Master bedroom has a good size en suite shower room. To the rear of the property there is a mature enclosed garden with a pond. There is a garden shed with power and a patio seating area where alfresco dining can be enjoyed. UPVC double glazed door into entrance hallway. Radiator, laminated flooring and ceiling light. Stair to first floor. Wooden double glazed obscure window. Low level W/C and wash hand basin. Laminated flooring and ceiling spot lights. Wooden double glazed window overlooking the front garden. Laminated flooring, radiator and ceiling light. Double aspect double glazed wooden windows to the front and rear. Wooden double glazed door onto the garden patio area. A modern fully fitted kitchen. A range of wall and base units complimented by roll edge worktops. Space for fridge, dishwasher, washing machine and tumble dryer. Single over with gas hob and hood over. Stainless steal round sink and drainer with tap over. Under stair storage cupboard, laminated flooring, ceiling spot lights, radiator and thermostatic meter. Wooden double glazed box bay window overlooking to front garden. Sliding door patio door leading on to the patio garden area where alfresco dining can be enjoyed. Feature gas fire and surround. Carpeted flooring, ceiling lights and radiator. Wooden double glazed window to the rear. Door leading to bedroom and a family bathroom. Over stair storage cupboard. Wooden double glazed window to the rear overlooking the garden. Carpeted flooring, radiator and ceiling light. Door to ensuite shower room. Wooden double glazed obscure window. Double shower enclosure with mixer shower. Pedestal sink with taps over, low level W/C, heated towel radiator, tiled flooring and inset ceiling spotlights. Wooden double glazed window to the rear. Carpeted flooring, radiator and ceiling light. Wooden double glazed window to the front. Carpeted flooring, radiator and ceiling light. Wooden obscure window to the front. Panelled bath with electric shower and glass screen over. Vanity unit with inset sink over. Low level W/C. Vinyl flooring, heated towel radiator and ceiling spot lights. To the front of the property there is a wrap around garden. Driveway parking for four cars and a single garage. The garage has an electric garage door. The rear enclosed garden has been well maintained with a patio alfresco dining area. Well established pond, shed with power and lighting, outside water tap and an outside electric connection.